Trypanosoma sp. among red blood cells. Trypanosoma is a genus of parasitic protozoa. There are in the class Kinetoplastida. They are a monophyletic group of unicellular parasitic flagellate protozoa. All trypanosomes are need more than one particular host to complete life cycle. Most are transmitted by a vector, usually by blood-feeding invertebrates. There are different mechanisms among the various species. In an invertebrate host they are generally found in the intestine, but in their mammalian host they usually live in the bloodstream or inside cells. 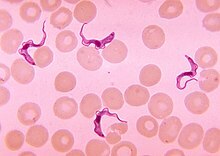 Trypanosomes infect a variety of hosts and cause various diseases, including the fatal human diseases sleeping sickness, caused by Trypanosoma brucei, and Chagas disease, caused by Trypanosoma cruzi. The mitochondrial genome of the Trypanosoma, and other kinetoplastids, is made of a highly complex series of circles and minicircles. It needs many proteins for organisation during cell division. ↑ Hamilton P.B. et al (2004). "Trypanosomes are monophyletic: evidence from genes for glyceraldehyde phosphate dehydrogenase and small subunit ribosomal RNA". Int. J. Parasitol. 34 (12): 1393–404. doi:10.1016/j.ijpara.2004.08.011. PMID 15542100. http://linkinghub.elsevier.com/retrieve/pii/S0020-7519(04)00189-4. This page was last changed on 1 May 2016, at 23:10.